Dr. Wendy Yang’s Global Change Ecology Lab, at the University of Illinois at Urbana-Champaign, is currently using the Apogee SO-110 oxygen sensor, with the optional diffusion head, for quasi-continuous measurements of bulk soil oxygen concentration in managed and natural ecosystems. Their quasi-continuous field measurements of soil oxygen has allowed them to correlate soil oxygen concentrations with process rates and determine how soil oxygen concentrations relate to precipitation and soil temperature, which can drive high biological oxygen demand to induce anoxia. The Apogee SO-110 allows Dr. Wendy Yang’s Global Change Ecology Lab to collect long-term data sets in the field without fear of compromising the sensors under harsh conditions, due to the sensors ability to withstand cold winter temperatures and wet conditions. 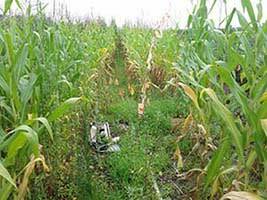 Oxygen is a major control for reduction-oxidation reactions in soil and can lead to the production or consumption of methane and nitrous oxide, both potent greenhouse gases. Processes such as methanogens and nitrous oxide reduction to dinitrogen were once thought to be restricted to flooded or saturated soils such as those found in wetlands, however, Dr. Wendy Yang’s lab has documented the importance of these processes in unsaturated soils from upland ecosystems. 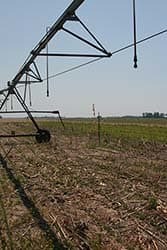 Their measurements have allowed them to correlate soil oxygen concentration with process rates and determine how soil oxygen concentrations relate to precipitation and soil temperate, even under saturated soil conditions. 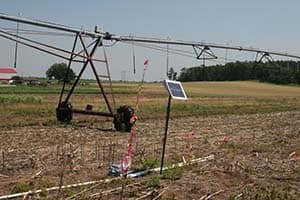 They are currently investigating these relationships in agricultural fields in the Midwest to better understand how current land management and historical soil drainage patterns mediate soil greenhouse gas emissions.